"Mr. Watson, come here; I want you!" These historic words, the first articulate sentence ever spoken over an electric telephone, were uttered by Alexander Grahm Bell when he spilled on his clothes some sulfuric acid which was part ot the transmission apparatus. It was the night of March 10, 1876. The receiver was a tuned reed. "My word! It talks!" 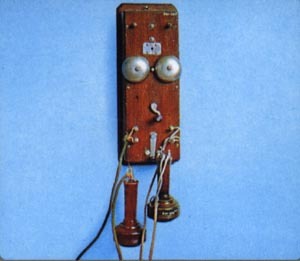 exclaimed Emperor Dom Pedro of Brazil on June 25, 1876, when he listened to the receiver of this earlt telephone at the Philadelphia Centennial Exposition. One of the judges, Sir William Thomson (later Lord Kelvin) called Bell's invention "the most wonderful thing in America." 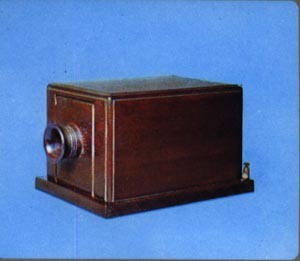 The round, camera-like opening on this box instrument served as transmitter and receiver, needed mouth to ear shifts. Development by Bell in the fall of 1876, it went into service in 1877 when a boston banker leased two instruments which were attached to a line between his office and his home in Somerville, Mass. 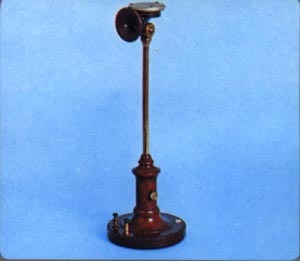 In 1877 Bell designed the first set with a combined receiver and transmitter that could be held in one hand. It was made of wood and resembled a dairy butterstamp, hence its name. It was in service when the world's first commercial switchboard opened in New Haven in 1878. The pushbutton was used to signal the operator. The Blake transmitter greatly improved telephone service. Here, it's walnut case has been mounted on an adjustable stand to make one of the earliest desk sets. 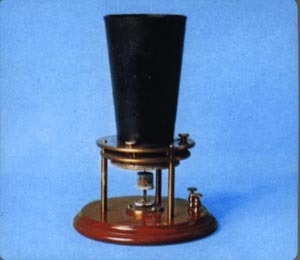 This instrument, invented in 1878 by Francis Blake Jr. employed carbon - a technique developed by Thomas Edison - and transmitted the voice with increased clarity. This handsome instrument, encased in oak and using the Blake transmitter and Bell's hand receiver, was the first telephone built for the Bell System by Western Electric. It was in service for many years and was one of the first side-winder models on which you turned the crank to signal the operator. 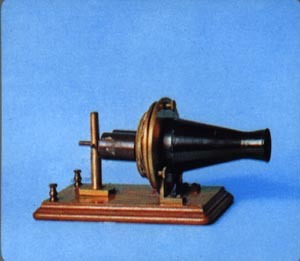 The search for better ways of transmitting the voice led to the development of this model which used a platinum diaphragm for better long distance transmission. The instument shown in this picture actually was use by Bell and later by Theodore N. Vail, organizing genus of the Bell System. 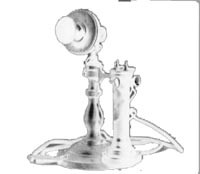 An early effort to make the telephone more decorative as well as more compact can be seen in this souvenir of the Gay Ninties. The carbon transmitter is becoming less unwieldly, the receiver has been reduced in size so that it was called a "watch case" receiver and the ornate base reflects the taste of the era. In the early '90s the telephone began to assume the shape in which it was to become familiar to Americans for the next three or four decades. This ancestor of the upright desk set was made in 1897 and represnted a refinement of earlier similar models. It was made of cast brass. The effort to make telephoning more convenient is perpetual. 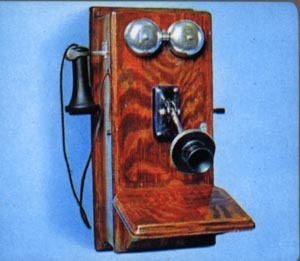 The early telephones were voice-powered. Then a wet battery was used which, though an improvement, sometimes rresulted in acid on the carpet. Dry batteries came next. The fourth stage was the common battery, with the power supply at the exchange. 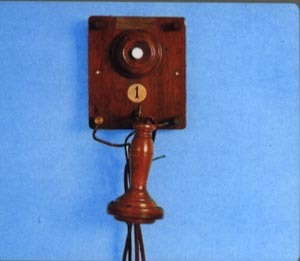 This is a more modern version of the telephone with built-in generator mechanism to prrovide currrent for signaling the operator. 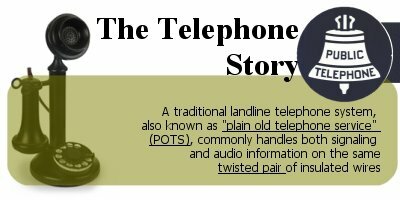 Almost exactly similar telephones were in general use from the late 90's through the 30's. Some still are in service in rural areas. 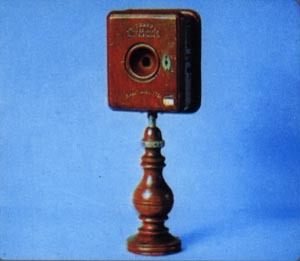 Note enclosed receiver terminals, an improvement of 1907. 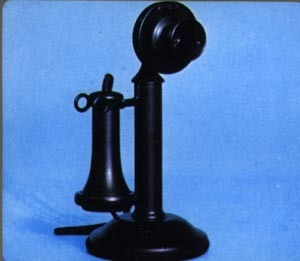 This somewhat streamlined pedestal desk telephone first appeared in black finish in 1910 though its prototype - a nickle plated affair - dates back to the turn of the century. These telephones were made of cast brass and later steel and were the All-American standard for the next quarter century or so. Some are still in use. The wall telephone is becoming more compact. 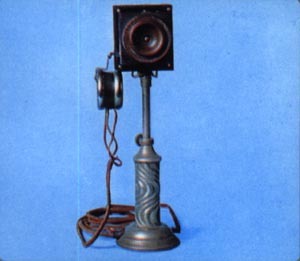 Instruments like these were in general service and were also forerunners of the Home Interphone System. 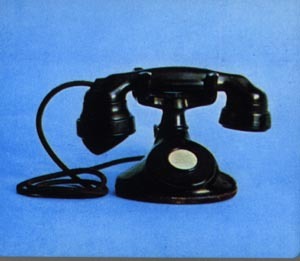 They provided intercommunication within the home and were advertised by Western Electric as "the greatest little step-savers that ever helped a housewife". The first dial telephone exchange is credited to Almon B. Strowger who introduced it in LaPorte, Indiana, in 1892. It was many years, however, before switching equipment was sufficently developed to permit dial installation in larger cities. New York City, for instance, began to get the dial in 1922. 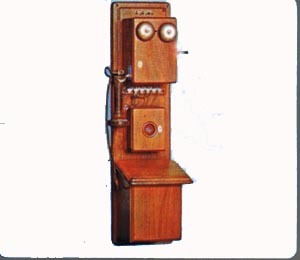 America got a new look in telephones in 1927 when the combined receiver and transmitter idea, used since 1878 by telephone linesmen, was sufficiently improved to be adapted for general service. 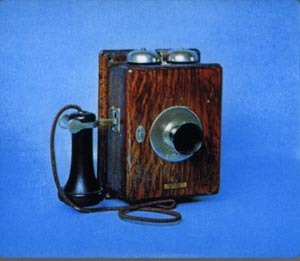 It was popularly known as the "French Phone" because it resembled continental instruments. 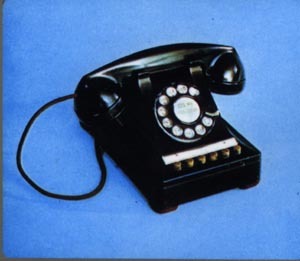 Thistelephone like the 1928 set came withor without dial and resembled its predecessor except that instead of a round base it had an elliptical or oval base. Within a few years after its introduction it was being offered in a variety of finishes including ivory, gray, statuary bronze, oxidised silver and in gold. An innovation in desk set design was the placing of the bell in the base of this model. 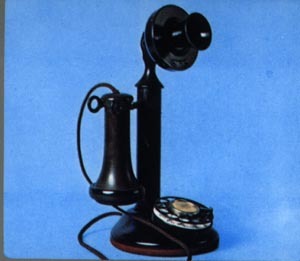 Earlier versions had housings made of metal but plastic was substituted in the early 1940's. The "300" served throughtout World War II while the energies of most telephone people were devoted to defense work. 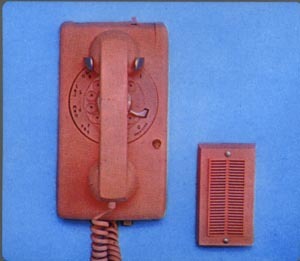 Here is an early model of a wdely used business telephone, with one "hold" button and five others for calling, signaling or access to other extensions. During more than a quarter of a century of service, this type of telephone has proved very usfull for both internal and external communications. First in the new "500" series, which later would include a variety of colors. 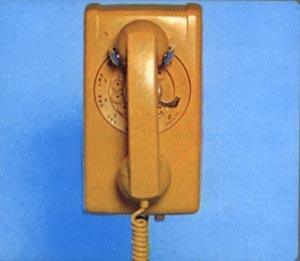 Rugged and functional, the "500" was the most commonly used telephone in the United States. 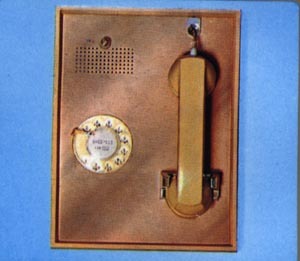 Standard with all the sets in this series is an adjustable volume control for the bell located in the base of the telephone. 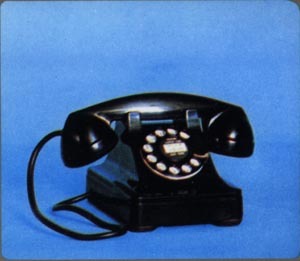 In 1954 the telephone statrted to become a decorative household item. 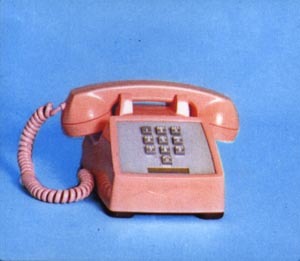 Although some colored telephones were available much earlier, they did not gain widespread popularity until the advent of the "500" color series. The five basic colors currently available are white, beige, green, pink and blue. The telephone returns to the wall in this companion piece to the "500 desk set. Designed for convenience, the wall set is most often used in the kitchen where counter and table space is at a premium. It is also popular in such areas as basements, garages and covered patios. Colors: White, beige, green, gray, pink and blue. Microphone and speaker units free the user's hands to make notes or look up reference material. It also permits conference conversations between groups at different locations. 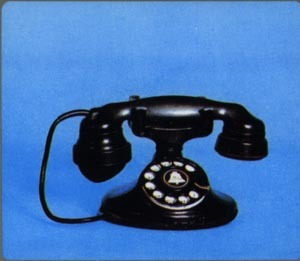 If privacy is desired, it may be used as a conventional telephone. Colors: White, beige, green, gray pink and blue. Used in a variety of business office aplications, the CALL DIRECTOR set was designed to handle several incoming, outgoing and inter-office calls at the same time. 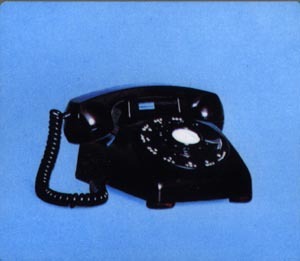 There are two main types - the 18 and the 30 button models - which can be used with handset, headset, or speakerphone. Colors: White, beige, gree and gray. "It's little, it's lovely, it lights . . ." The desk set gets a smart new look. 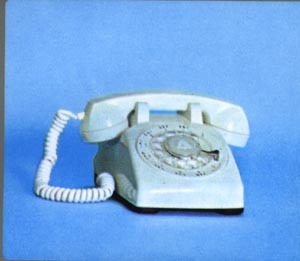 Compactness, atractive styling and illuminated dial (it lights up when you lift the handset or you can keep it on as a night light) contributed to the all-around usefulness of the PRINCESS telephone which comes in white, beige, blue and turquose. 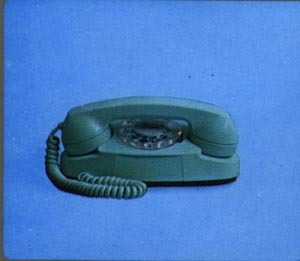 An outgrowth of the inter-communicating services offered to businesses for many years, HOME INTERPHONE service employs specially equipped telephones and speakers to handle regular telephone calls, communicate between rooms, talk with someone at the door, check on children, even call a dog to his dinner. 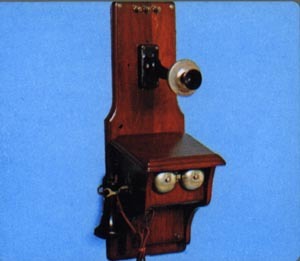 Latest in the line of wall telephones, the PANEL PHONE mounts flush with the wall. A special feature is a retractable handset cord that winds up automatically within the set. There are two color combinations: Copper faceplate with beige handset, and anodized aluminum faceplate with white handset. Heralding a new era in communications, the dial is replaced by pushbuttons. As each button is pressed, two simultaneous musical tones are generated and transmitted to a central switching office, then translated into a series of pulses similar to those made by the standard telephone dial. 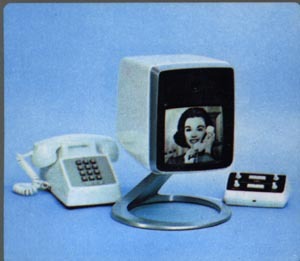 It is now in production by Western Electric. 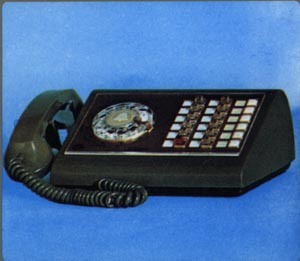 Latest in the line of telephones is the 12 button Touch-Tone Trimline set which combines handset and pushbuttons in one lightweight unit. Although only ten buttons are needed to take advantage of today's telephone services, the two extra buttons on theses sets prepare them for the demands of the future. See the person you're talking to? It's the newest step in telephone equipment. 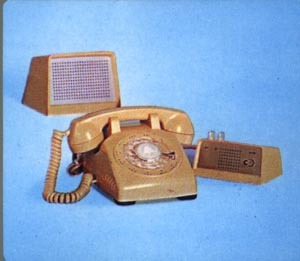 This is the Mod II Picturephone set now in pilot production at Western Electric. The picture unit has a "zoom" feature which permits individual or group viewing. 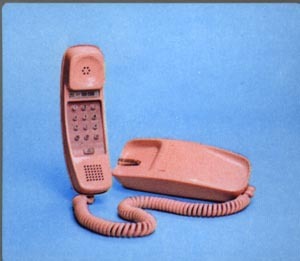 Mod II includes a new 12 button Touch-Tone telephone.